The internet is not absent of about 500,000 blogs and chats on how to best optimize Instagram for small business development. However, in my 5+ years of using this social media platform for creative business development and educational blogging, I have learned a few tips on how to optimize this space for any type of creative business.
. If the name of your company is already in your Instagram handle, consider writing the type of business you have in the "Name" portion of your profile instead of restating the name of the business. This puts it out there to new users what you are all about without even going through your entire profile. 1. What you post about your Instagram. For example on my Instagram, I create posts mostly about photography and textiles. So in the at space I wrote "Photography and Textiles." 2. You could write the type of company you own if its not evident the title of your business. If your business is called "Red Elephant Designs" and you designed and crafted leather bags or jewelry, you might consider writing "Handcrafted Leather Goods" in that part of your profile. Instagram followers are extremely loyal. They love to be able to relate to whose content they are reading on a human level. If you can find a way to weave a personal story in your post that relates back to your product or business, it helps engage your audience in an authentic an meaningful way. For example, this is my personal business and finance expert that I refer to for all things money and business, Kate Northrup. Kate notoriously attracts women small business owners to her work since she wrote a ground breaking book about our beliefs around money called Money A Love Story. 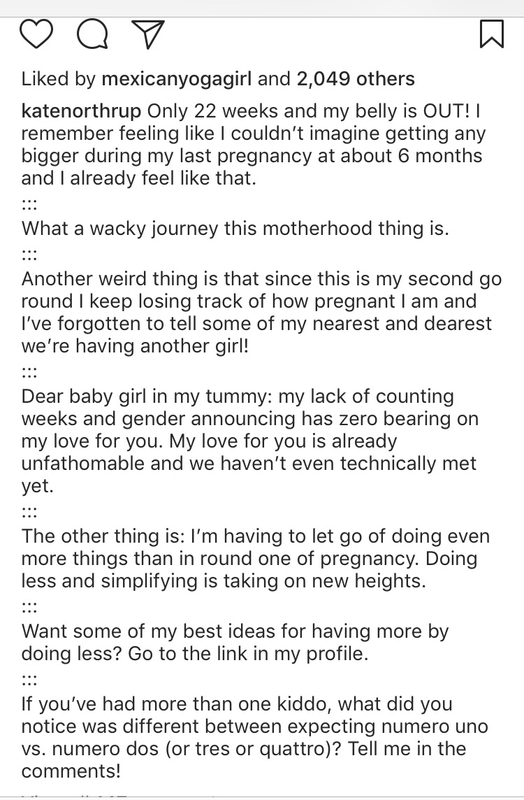 In this post, she tells her audience that they are having a baby girl and mentions the changes she is feeling in her life and business with these upcoming life changes. This engages her core audience, which happens to be entrepreneurial mothers of child bearing age. Side Note: Each person has a different level of comfort they are willing to share on Instagram. We each have to find our own personal boundaries on what we are willing to share with our audience when using this marketing tip. One other strategy that Kate uses in her Instagram posts that is visually appeasing to the eye is separate the long texts of her stories into two or three lines to make it easier for consumers to visually take in at a time. Finally at the end of her story she asks her followers to respond about their experiences that relate back to her story. I used to believe that the most popular hashtags were the ones I needed to use. However, it came to my attention in a business and marketing workshop I was in that I might actually consider using the lesser known hashtags that had been used in 5,000-500,000 posts since the most popular hashtags were often overly saturated. The smaller but still widely used hashtags gave the content that I created a much higher chance of being seen by a new audience. One of my personal favorite female business entrepreneurs, Danielle Laporte stated recently in an interview, "Show up for those who are at the table." In a fast paced, competitive business world, we at times forget about the people who already support us and are loyal to our brand, business or vision. While getting more followers should be part of a marketing business plan, it shouldn't the business plan. Creating content that make people want to keep coming back to you day after day is truly the heart of using this platform in an authentic and meaningful way.